The "anchor defenseman" has long been a necessity in the NHL. Team builders start with a goalie who can win, a defenseman who can defend and move the puck, and a high-scoring forward. Some general managers will then add an array of complementary defensemen to the anchor defenseman and some will invest in a No. 2 defenseman nearly as good as the leader. In the Northeast Division, two teams, Boston and Toronto, put two defensemen on the list of the top five in average time on ice. The Bruins boasted leader Zdeno Chara and Dennis Wideman, while Toronto placed the departed Bryan McCabe, and Tomas Kaberle. Ottawa and Buffalo did not have a defenseman in the top five. Jaroslav Spacek led Buffalo with an average of 22:58 minutes per game, but that only happened because they traded Brian Campbell at the deadline. Campbell averaged 25:06 with Buffalo and San Jose. Ottawa was led by Chris Phillips' 22:28 minutes per game. When it comes to ice-time in the Northeast Division, the Senators' trio of Daniel Alfredsson, Dany Heatley and Jason Spezza are hard to beat. Zdeno Chara, Boston Bruins -- What a great signing this turned out to be. Boston Bruins General Manager Peter Chiarelli was the assistant GM in Ottawa when Chara was one of the defensive leaders. Chiarelli made Chara the foundation of the Boston franchise with his first free-agent signing. Chara had a fairly good first year in Boston, leading the NHL in average ice time, but he had an outstanding season last year, posting 17 goals with 34 assists and a plus-14 rating. Chara led Northeast Division defensemen and was third among NHL blueliners with an average of 26:50 minutes per game. Chara was an important player in all situations as well. He led the Bruins and was sixth in the NHL with an average of 18:52 minutes of even-strength time. Chara also led the Bruins in power play time and shorthanded time. Chara was tops on the Bruins and sixth in the NHL by averaging 57 seconds per shift. Not only is Chara the Bruin you see most on the ice, he is their defensive-scoring leader, penalty-minute leader, shot leader, most accurate shooter and tied for the defensive lead with 9 power-play goals. The sunny, optimistic mood in the Bruins' dressing room last season reflected Chara's disposition and he was key to the team responding so well to coach Claude Julien. Dennis Wideman, Boston Bruins -- Wideman didn't have much of a resume when Chiarelli traded scorer Brad Boyes to St. Louis for Wideman at the 2007 trade deadline. Boyes then had four goals and 12 points in the final 19 games and opened last season with 9 goals and 11 points in the first 10 games. Chiarelli made the deal because the Bruins were short on young, right-handed-shooting defensemen. His development last season was due to increased maturity. Wideman has always been seen as a good offensive defenseman, but Julien and his staff improved his defensive play last season. Wideman had 13 goals and 36 points and was plus-11, his first plus season anywhere since juniors five years ago. Wideman was second on the Bruins in every time category. He averaged 25:09 minutes per game and 18:28 of even-strength time. He averaged 2:57 shorthanded minutes per game and an average of 3:43 minutes on the power play. 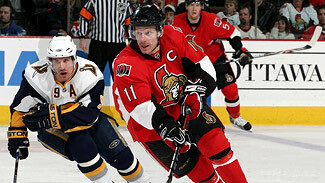 Filip Kuba, Ottawa Senators –- The Senators hope Kuba can replace the minutes lost by the departed Wade Redden. Kuba, acquired over the summer from Tampa Bay, certainly has no aversion to hard work, as his 24:57 of ice time per game was second among Lightning defensemen last season. Kuba also played in all situations in Tampa, seeing an average of 3:10 per game killing penalties and 3:37 per game on the point on the power play. While Kuba had just 6 goals last season (after scoring 15 in 2006-07), he posted a career-best 25 assists while playing 75 games. Andrei Markov, Montreal Canadiens -- Scientists last month said they have discovered a material that can bend light around objects, making them invisible. Markov figured out how to do that with himself years ago, avoiding the harsh glare of Montreal's fans and media. Consider, he quarterbacks the Montreal power play, leads the League in power-play goals from the blue line and over the past two years, his defensive partners, Sheldon Souray and Mark Streit, have gotten the credit. But it was Markov that the Canadiens paid to stay. It's often been said a defenseman has a good game if you don't notice him. Despite his team-leading ice time, you rarely notice Markov, one of the best players in the NHL at his position. He was fourth among NHL defensemen with 16 goals, seventh with 42 assists, sixth with 58 points and tied for the League lead with 10 power-play goals. He added a shorthanded goal and two game winners. He was Montreal's representative at the 2008 NHL All-Star Game and scored a goal. Markov is not just an offensive defenseman. Alexander Ovechkin named him the toughest defenseman in the NHL to try to beat one-on-one. Markov led the Canadiens by averaging 24:58 minutes of ice time per game and 5:10 minutes per game on the NHL's leading power play. His 16:37 of average even-strength time was third behind Roman Hamrlik, and Markov's defensive partner, Mike Komisarek. His 3:10 of shorthanded time was second to Komisarek, making them the team's top penalty-killing defensive duo. Tomas Kaberle, Toronto Maple Leafs -- Just as Markov makes himself invisible, Kaberle makes himself hard to hit. He's very much like his older brother Frank, with the Carolina Hurricanes, and the former NHL and Olympic great, Petr Svoboda, in that regard. They just slip checks that you think will wreck them. As a result, Tomas has played 82 games in five of his nine NHL seasons, dating back to 1998. Kaberle has missed only 32 games in nine years while posting 69 goals and 333 assists for 402 points in 681 games, an average of .59 points per game, 10th-best among active NHL defensemen. He led Maple Leafs defensemen with 45 assists, one less than team leader Mats Sundin, and 53 points, third-best on the team. Kaberle had an "off" season by finishing minus-8, only his second season in minus territory. He had only 22 minutes in penalties so he hits less than he gets hit. Kaberle led the Maple Leafs and was fourth among NHL defenseman by averaging 5:21 minutes of power-play time. He also led Toronto with 18:07 of even-strength time. He was second to McCabe on the Maple Leafs with 24:52 of overall ice time and fifth on the team with 1:22 minutes of shorthanded time per game.